What is an ethical breeder, anyhow? 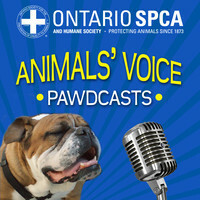 In 2013, Valina, along with Dr. Andy Mencarelli, DVM, participated in a OSPCA PAWDcast! During this radio-style interview, we discuss breeder inspections, ethical breeding, and all that goes along with it! Or find out what other people have been saying about our breeding practices. Occasionally, we are asked for references or testimonials from past clients. Although these do have their place in finding you next furry family member, they should not take the place of visiting the kennel first hand or seeking the opinion of a professional. We requested that our veterinarian, Dr Janice Reid, conduct a kennel inspection on behalf of those who can not feasibly travel to our kennel. I had the pleasure of visiting Carleton and Valina Pope, the owners of Starstruck Labradors on October 26, 2011. I have known Carleton and Valina for two and a half years and have seen nearly all of their breeding animals and many of their puppies. I was very impressed when I visited their facilities. All of the kennels and pens had ample space for their dogs to exercise in, were immaculately clean, and best of all their dogs looked happy, comfortable and well fed. The kennels used for whelping were also very impressive with tile flooring and in-floor heat, an ideal environment for puppies and their mothers. I also reviewed some of the records regarding their breeding animals. Extensive genetic screening is done on their animals to ensure the quality of their breeding stock. OFA radiographs of hips and elbows are also routinely performed on their breeding animals. It is obvious that great care and consideration is involved in each breeding that occurs. What I appreciate about Carleton and Valina’s business from a veterinarian’s perspective is the genuine care and attention they give each of their animals. They also have a strong and admirable desire to produce and sell well bred and well mannered animals that truly reflect the characteristics of the Labrador breed. I also appreciate that after a male or female has contributed to their breeding program, they are neutered or spayed and a loving and caring home for them is carefully selected. It has been a pleasure and a privilege to be able to work hand in hand with Carleton and Valina in their pursuit to produce high quality animals and I look forward to watching and helping them achieve their goals. Beginning in May of 2012, the Calgary Humane Society spearheaded a new breeder inspection program, a great leap toward the end of substandard breeders! However, sadly the program was short-lived, as there were too few breeders willing to open their doors to be voluntarily inspected! Our kennel was the first to offer itself up for this voluntary inspection, and the first to pass! We hope to see this program start again soon . Trying to raise the standard with a kennel inspection of our own, we hope that many other breeders will follow our example. In this way, we hope to help reduce the proliferation of sub-standard breeding operations, both large and small. Please help us reach this goal by asking any other breeders you speak with to provide documentation of a full kennel inspection performed by a veterinarian or the Humane Society! There is no excuse for un-inspected kennels! DO NOT buy a dog or puppy from ANY breeder who has not been inspected by a licensed third party! Starstruck Labradors was honored at the Chateau Lake Louise. Here we are, accepting the Responsible Breeder award for 2012! Unfortunately, the dogs were otherwise occupied, and couldn't be in attendance that evening. Only one award is given per year, and 2012 was our time to shine! Although we are very happy to accept this award, we hope to have more competition next year as more breeders take to higher ethical breeding practices. To the left, is an Improvement Breeder Award, given to us in honour of our efforts to make improvements to the breeding lines we use in the Labrador Retriever. 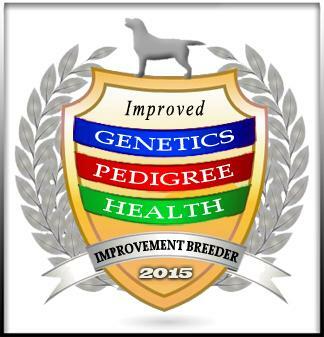 Genetics, Pedigree, and Health are three different awards that acknowledge the lengths that good breeders will go to for the improvement of the breed, particularly the dilute colours.